Paul and Tunrayo Alagbe were married on September 3, 1998 and had their first child on December 29, 2014. RITA OKONOBOH chronicles the couple’s journey through the years of trials to the unfolding of boundless blessings. I waited patiently for the LORD; he turned to me and heard my cry. He lifted me out of the slimy pit, out of the mud and mire; he set my feet on a rock and gave me a firm place to stand. He put a new song in my mouth, a hymn of praise to our God. Many will see and fear the LORD and put their trust in him (Psalm 40: 1-3). The above Psalm verses aptly describe Mrs Tunrayo Alagbe’s testimony of the Lord’s goodness as she finally gave birth to a daughter at a few months shy of 60 years of age. 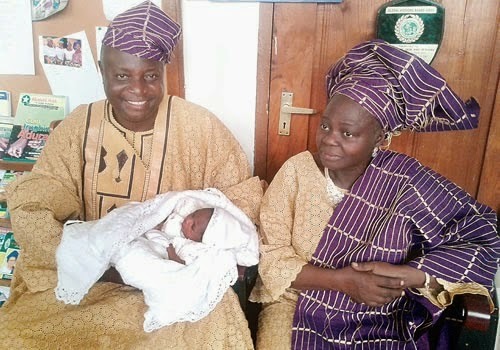 It was a sunny afternoon on Monday, January 5, 2015, and the atmosphere was radiantly purpled by the stylish outfits of many who had come to witness the naming ceremony of the lovely daughter of the Alagbes. The crowd was surprisingly large, even for the African setting, as many braced the burning rays beating down on the premises of the Women Missionary Union (WMU) headquarters of the Nigerian Baptist Convention (NBC), Total Garden area, Ibadan, just to show their solidarity with the couple. The Retired Executive Director, Women Missionary Union, Nigeria, and a close friend of the family who anchored the naming of the baby, Reverend Mrs Yemi Ladokun, took the audience through the time of waiting. She showed to the crowd some flowers from the bouquet used during the wedding and stated that she had kept the flowers thinking she would use them during the year after the wedding during the naming ceremony of a child but she was wrong as she had to wait for almost 17 years. The child was given close to 40 names including, Halleluyah, Testimony, Esther, Jesulayomi, Ileri-Ayo-Mi, OkikiJesu, Adepate, Oluwatoyin, Omoronike, Ibiyemi, Oluremi, Motunrayo, Mo-F’Oluwa-ke, Aderonke, Odunola, Eri-Ipe, Ewa-Iyin, Itan-iyanu-ife, IturaOluwa, Favour, Oluwadamilare, Titilayomi-niwaju-Oluwa, among other significant names. On her general outlook during the period of not knowing how things would turn out, Mrs Alagbe, whom many describe as cheerful, warm and always ready with a smile, narrated “I kept hoping. I cherished my personal relationship with God because I know that the day you die, this issue of having children no longer has meaning. So, I was jealously guarding my personal relationship with God, especially in relation to eternity. I tried to enjoy other things God has blessed me with. Mrs Alagbe, who started treatment in early 2014, was confirmed pregnant in April 2014 and the reaction of the couple when the news first broke is too much to sufficiently capture in words. “I didn’t believe it. It didn’t have much meaning to me. It was like I was dreaming. However, as time went on, I saw it becoming a reality. I just kept thanking God because He said He will do it according to his promise in Psalm 40. I know that this miracle is for God’s name to be glorified and for the hope of people to be reawakened so that they believe that God still works miracles. God never comes too late,” Mrs Alagbe stated. While acknowledging that going through childlessness is no trivial task, Mrs Alagbe advises couples in this situation to guard their relationship with God whatever the eventual outcome. As she points out, “Even if at the end of the day, God doesn’t do it, it is to the advantage of the couple. I reached that stage where I told God that if He doesn’t do it, I’m okay with His decision because He knows what is best for me. My advice is that they should hold on to God and ensure that their personal relationship with God stands. They should also do other things to serve God because when you serve God, you are not likely to be too sorrowful and you’ll be happy to meet the needs of others and minister to people. Couples should not aimlessly trust God but anchor on a verse on the Bible and trust the eventual manifestation of God’s word. They should also help others. You can still help people even in your own sorrow. When you minister to the needs of people, your burden is lightened. Mr Alagbe, affirmed by friends and church members to be a friend of children and who also teaches children in the church, advises couples in the situation to ensure that they are not hostile to people, especially children, no matter how hard it seems. The President, Ibadan Baptist Conference, Reverend (Dr) Yemi Adekunle, in his prayers for the family, prayed that their faith remains unshaken and that God’s favour will radiate not just in the family but through all present. For prayers, encouragement and for witnessing the ceremony, the Pastor, First Baptist Church, Ibafo, thanked and prayed for God’s blessings upon all.